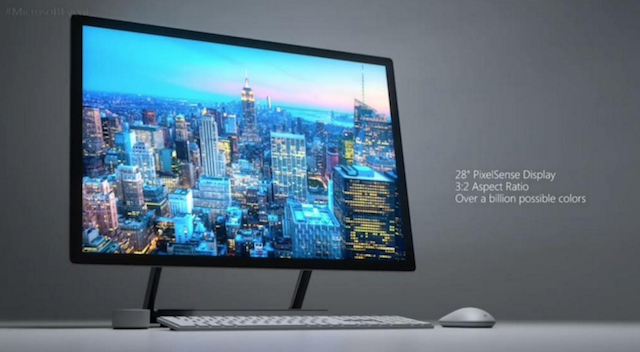 Microsoft revealed a new all-in-one PC at its Imagine What You’ll Do event in New York City. The Microsoft Surface Studio is a desktop designed to rival Apple’s iMac. Built for creators and professionals alike, it features a 28-inch, 12.5mm thin touchscreen that’s capable of projecting a greater than 4K display. The Microsoft Surface Studio will run on Windows 10, and will be perfectly compatible with the upcoming Creators Update. Other than its high-quality monitor that can display either DCI-P3 color and RGB on the fly, it also touts itself as more than just an iMac clone. This versatile piece of tech comes built with a 6th-generation Intel Core i5 processor, 1TB of internal storage, 8GB of RAM and a 2GB GPU. And those are just the specs of the starting model, currently priced at USD 2,999 (around PHP 145,286). For USD 500 more, you can get a variant with a more powerful Core i7 CPU and 16GB RAM. If you’re curious about the best that the Surface Studio can offer, the USD 4,199 (around PHP 203,420) variant will come with a Core i7 processor, a 2TB storage disk, 32GB of RAM and a 4GB NVIDIA GeForce 980M graphics card. All Surface Studio variants will come with a wireless keyboard and mouse, as well as support Xbox 360 and Xbox One controllers. Microsoft plans to begin shipping of the Microsoft Surface Studio starting December 15.